I’ve never been a sausage pizza fan, it was actually the one thing I always say I don’t want on pizza. 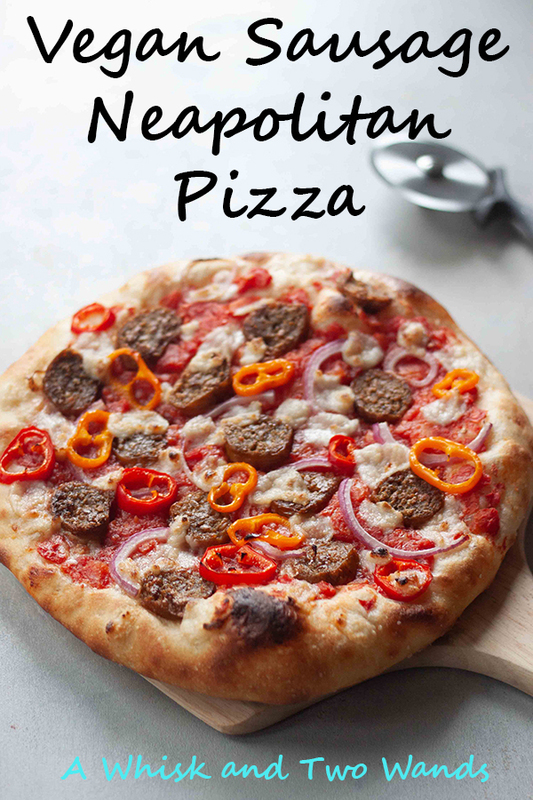 Yet here I am sharing a Vegan Sausage Neapolitan Pizza recipe with you and honestly if I was hungry enough could have ate the whole pizza it’s that good! 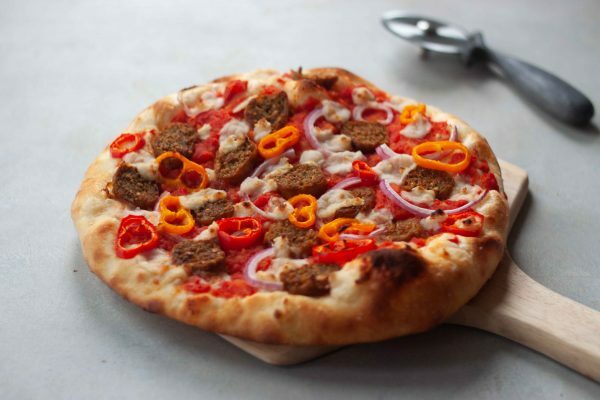 I almost didn’t want to share this recipe with you because the sausage I used is in high demand and shelves are pretty much empty and have been since it came out earlier this year but if you’re lucky enough to get your hands on some Beyond Meat Italian Sausage (Mild or Spicy) do it! This isn’t a sponsored post I just love it which is so funny and crazy. I was lucky enough to pick up a few packages when it was in stock and since I’m down to the last 2 packages and using them sparingly using just one sausage from the package to make this pizza was my genius idea and so worth it. 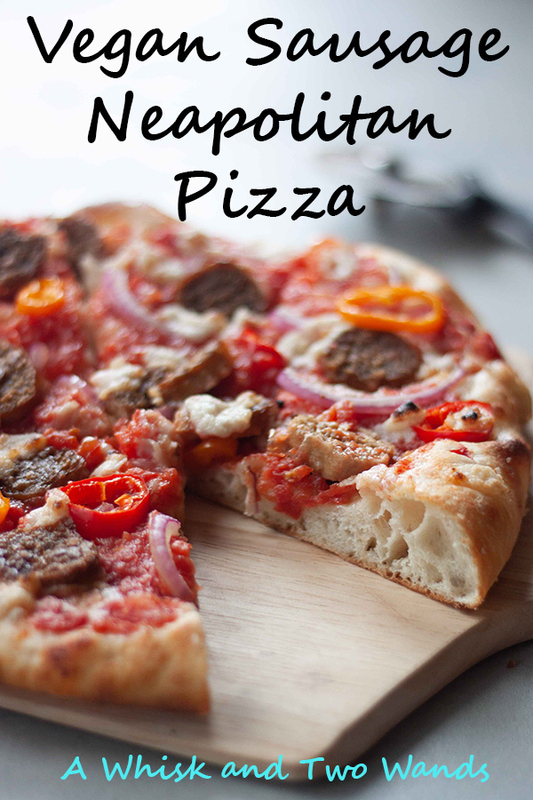 I just hope it’s back in stock soon because I can only make 6 more of these Vegan Sausage Neapolitan Pizzas! Or anything for that matter as I also liked it sliced on pasta. I broke out the last package we used up when we had homemade pasta night. Our homemade Neapolitan Pizzas are one of the most requested meals when people come over along with our homemade pasta, sourdough, and desserts. Family, friends, and the girls friends love them and it’s so much fun to make them as everyone gets to customize their own. There is one rule though, as it can be hours of making pizzas depending on how many people are here as each takes about 10 minutes and we’ve had 20+ people/pizzas before, when your pizza comes off the grill and is cut take what you want because after that it’s fair game. I’m not a fan of this rule and may have put this whole pizza on my plate when we made it again last Friday. Ok I didn’t only half but wanted to. The crust is so easy to make yourself and you’ll never turn back! The puffy pillowy crust, every time I make it I just can’t help but squish it and savor every bite. If this combo isn’t for you check out all our other pizza recipes or create your own combo! If you were at our pizza party what would your perfect pizza combo be? 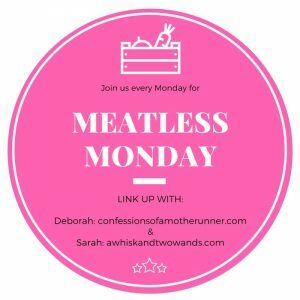 It is Meatless Monday, and this recipe highlights that there are options that might shock even the biggest meat-lovers! I look forward to seeing what’s happening in your kitchen and hope you link up with me and my co-host Deborah and share! I also hope you check out and are inspired by the recipes linked up below. A plant-based twist on a classic! 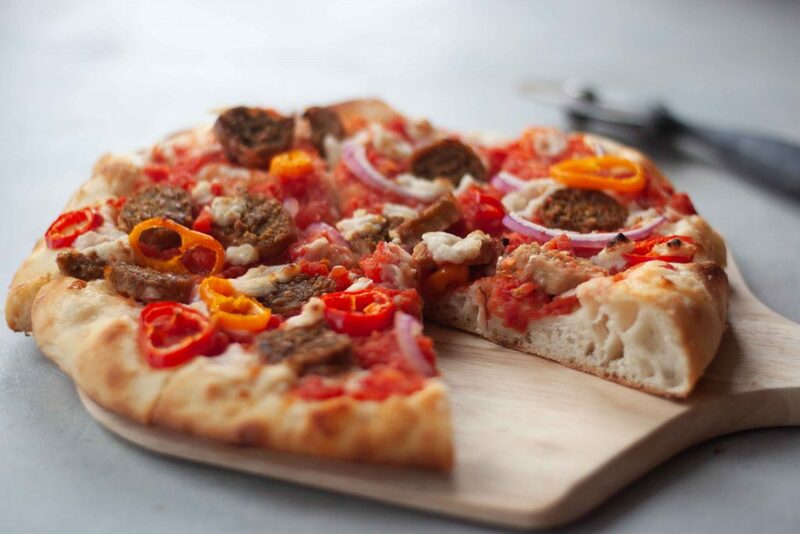 This Vegan Sausage Neapolitan Pizza starts with homemade crispy outside chewy inside Neapolitan crust. 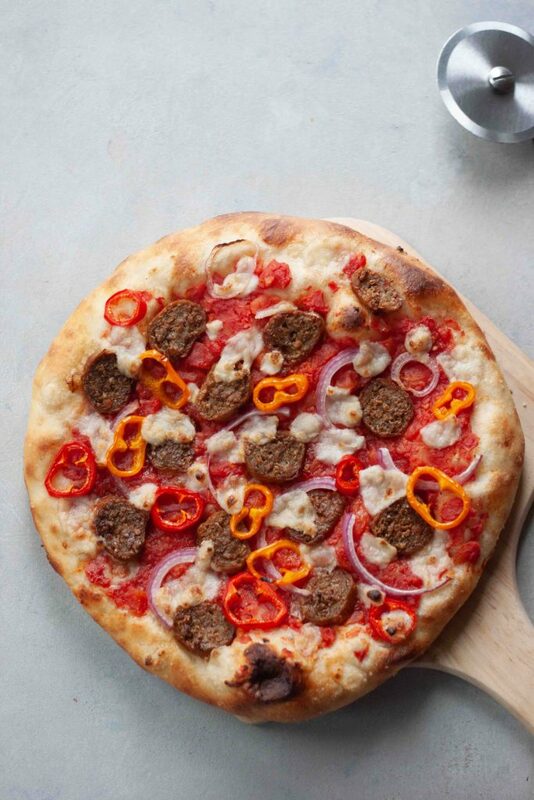 Topped with sausage, fresh mozzarella, peppers, and onions it's packed with flavor and will surprise even the biggest meat-lover. In a bowl whisk together the ingredients to make the Sriracha Drizzle. Place in the fridge until your pizza is cooked. Cook sausage if you haven't already done so, see notes. Add sauce to the crust leaving about a half inch boarder around the edge. Brush the outside boarder of the crust with olive oil if desired and sprinkle with a pinch of garlic or sea salt. Top with sausage slices, onions, and peppers. Grate or crumble cheese and sprinkle over pizza. Let pizza cool a minute or two before slicing. I like to cook my Beyond Meat Italian Sausage, slice, and then put the slices back in the cast iron pan for 20-30 seconds per side to make them crispy. To make our simple sauce we take canned fire roasted tomatoes and pulse them for 30 seconds in a mini food processor. Adding garlic or salt to taste depending on tomatoes used. If using Fresh VeganMozz it will crumble into pieces when fresh, if I have leftovers I place it in the freezer and the next time use a large hole grater to grate the cheese over the pizza. In my opinion you can never go wrong with Pizza and this looks delicious. I am usually not a sausage fan either but this sounds like a game changer. You really can’t, unless of course you over do it or it’s really greasey. That crust looks so amazing and fluffy. Just the way I like it! It’s so easy to make and it’s sure to be a favorite! Exactly why I first tried the sausage! I’ll have to look for this sausage – I love the taste of reg sausage but my tummy doesn’t process it AT ALL. I’ve been able to handle this one well. Hopefully you can find it soon it’s been out of stock. There is a Spicy Italian, Sweet Italian, and Brats. YUMM! 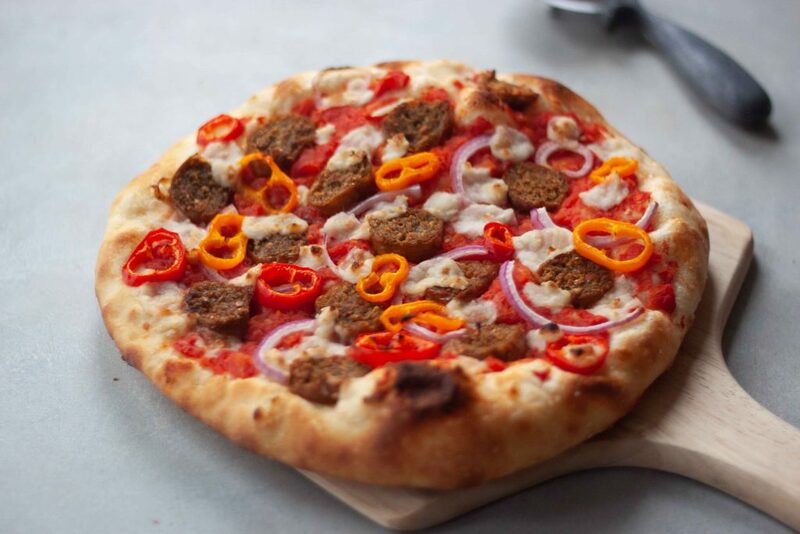 THe crust looks fabulous as does the vegan sausage! Thank you! The crust is so easy and I’m confident you’ll love it and it will be a new fav if you try it!